Jack - my first dog. To start with myself... I live with my husband Börje and our dogs in the country and I have had dogs since 1976. I've always had the interest in dogs and the reason why I have sporting dogs is that my parents-in-law had a Labrador Retriever. I've been active in the local dog clubs since 1985 where I have worked with the education section as well as the show section. Every now and then, I'm also working as a ring steward at both smaller shows and Kennel Club shows. Another interest I have besides the dogs is photography, and offcourse, dogs are often on the pictures! 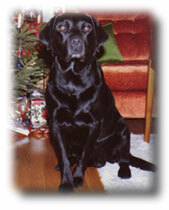 My first dog was a black Labrador who came to live with me at the year of 2,5. His name was Black Jack and was by Multi Ch Kamrats Buse and Candy. 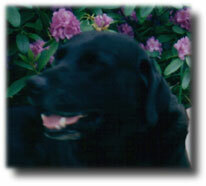 He was the true type of a Labrador and a much loved and constant family member. 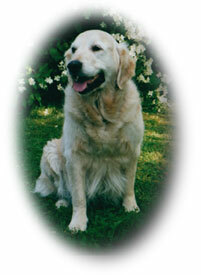 The next dog came in 1984, it was a Golden retriever female - Lady - who we picked up in Trondheim, Norway. We attended some obedience classes and competed a lot and got a first prize in Obedience class I. When Lady was a veteran, I got my interest for dog shows. She charmed everyone and lived on to be 13 years old! Kavat Another male Labrador - LP Kavat - entered our house in 1986. He wasn't a showdog at all but a dog who loved to work and was such a joy to work with. He became the dog of the master and in the obedience ring he got his diploma from the 1st class. Unfortunately, he got sick and only lived until his 7th birthday. In 1994, a new Labrador male was bought. His name was SVCh Grottbjörnens Barzec "Basse" by Ch Novacroft Mixedspice and Grottbjörnens Micheri. He started his career going Best Puppy of Breed at an allbreed Kennel Club show in Askersund and has as an adult won the prize of honors at dogshows. We have attended both obedience, working- and tracking tests and he got his champion title in tracking. Unfortunately, he died much too young at the age of 8. Click on his name to see pictures, pedigree and read more about him! Evita 3 months old. In 1997 Dewmist Seasprite “Evita” (Ch Stenbury Sea Chieftain - Ch Dewmist Shade of Pale) came to us. A little angel who came and returned to heaven. She only lived until she was 6 months old. 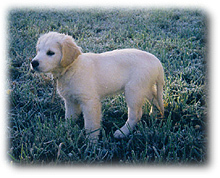 In 1998, a new Golden Retriever entered our house. This time a marvelous male named SVCh Dewmist Sheer Gold "Garry". He is by Ch SW-97 Marjamez Masterpiece and out of Ch Dewmist Shade of Pale. Together we have attended field trails classes, which has whet the appetite. We are also training obedience and he as got his champion title in tracking. He has also been shown. In the winter of 2002, Dewmist Dark Victory, a female called "Vicky" entered our house. She is by Nordic Ch Inassicas Song of Songs and out of Dewmist Divine Roses. She is a splendid girl with plenty of energy and loves everybody! She has been shown at championship shows! In the early summer of 2004 Dewmist Sacharissa, called "Sackie", moved to us. She is a lovely female who already seems to enjoy her new life with her new gang. It is with lots of excitement we will be following her growth!